The Trans Mountain pipeline expansion should be approved by the government of Canada, the country’s National Energy Board found Friday in a massive report. The project will likely harm endangered southern resident killer whales, increase greenhouse-gas emissions that worsen the impacts of climate warming, and could cause oil spills that would be damaging to the environment, the board found. However, the more-than-700-mile-long pipeline should be approved by the government anyway, the board found, because it is in Canada’s national interest. The environment of the Salish Sea is already degraded and disturbed and detrimental to the southern residents, the board found. The pipeline expansion’s increase in tanker traffic therefore will have significant negative impact on the whales, the board found. Washington state Gov. Jay Inslee deplored the decision. “The Canadian Energy Board’s own analysis found that this pipeline would be detrimental to the survival of the southern resident orcas, increase greenhouse gas emissions and worsen global climate change. Yet they still recommended that the expansion move forward. This is deeply irresponsible,” Inslee said in a prepared statement. Final approval now is before the government of Canada, which has nationalized the project, and has 90 days for its consideration. Canada wants to expand the existing Trans Mountain pipeline in order to ship bitumen oil to Asia in hopes of gaining higher oil prices than its market in the U.S. A pipeline spur from the existing Trans Mountain pipeline, in service since the 1950s, brings bitumen directly to Washington refineries, where a variety of products, including gasoline and jet fuel, are produced. 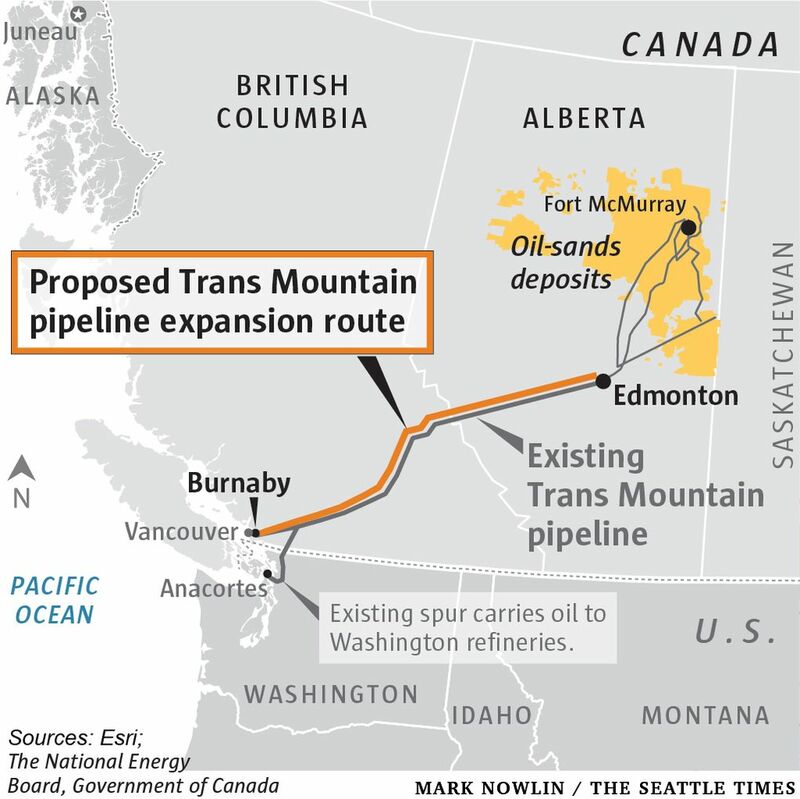 The expansion would nearly triple the amount of oil shipped from Edmonton, Alberta, to Burnaby, B.C., on the coast just outside downtown Vancouver. The $9.3 billion project would increase capacity to 890,000 barrels of bitumen oil a day, and increase tanker traffic in the Salish Sea from about six tankers per year to more than 400. The board imposed 156 conditions if the project is approved, intended to cover a range of impacts including emergency preparedness and response, consultation with affected indigenous communities, and pipeline safety and integrity. Most are the same conditions as from the board’s previous approval for the project in 2016. The Canadian Court of Appeals last August ordered the board to reconsider its approval, because it had inadequately considered effects on killer whales, and had inadequately consulted with First Nations. This time around, the energy board made 16 new recommendations to the Canadian government related specifically to marine shipping, including consideration of possible slowdowns in shipping routes, limits on whale-watching boats, noise reduction in ferries, and incentives and requirements for design of quieter vessels. Initiatives to improve marine oil-spill response, marine shipping and small vessel safety, and reduction of greenhouse-gas emissions from marine vessels, were also encouraged by the board. “The National Energy Board listened to a range of diverse views and carefully considered all of the evidence submitted, the results of which are reflected in the conclusions, conditions and recommendations presented in the report,” said Robert Steedman, the energy board’s chief environment officer, in a prepared statement. First Nations leaders said Friday the decision by the board was not a surprise, and that the process is hopelessly compromised by conflict of interest, given the government’s $4.5 billion purchase of the project last summer from Texas-based developer KinderMorgan, and Prime Minister Justin Trudeau’s vow to build it. The Canadian ministers of finance and natural resources each have also backed the project and its nationalization to ensure its construction. “It must be built, it will be built,” Finance Minister Bill Morneau said last spring, defending the Canadian government’s decision to buy the project after KinderMorgan threatened to walk away as intense opposition on the coast to the project pitted one region of the country against the other. The purchase was a political fix that has created other problems, including a cloud over governmental evaluation of its own project. “The fix is in,” said Chief Bob Chamberlin, vice president of the Union of B.C. Indian Chiefs, at a Vancouver news conference Friday. Legal action is certain if the Canadian government grants final approval, he and other First Nations leaders vowed. The remand consideration by the board included hearings with First Nations leaders that drew hundreds of participants from Native nations on both sides of the border. 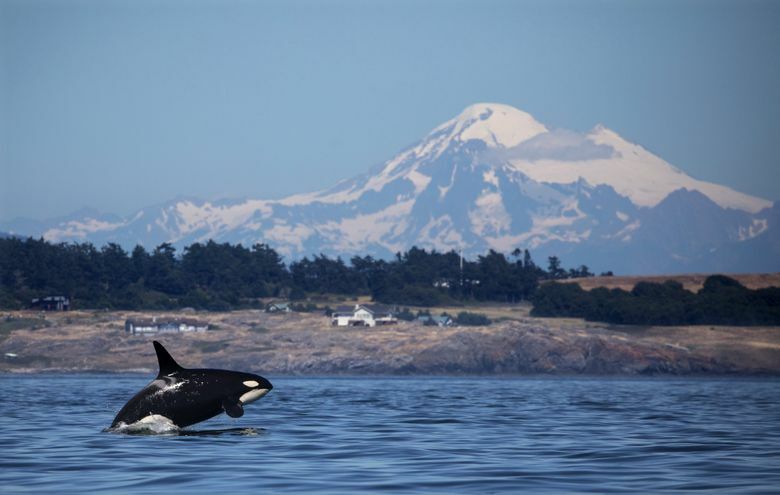 Washington tribes fiercely oppose the expansion because of concern over their treaty-protected fishing rights and the survival of the endangered orca whales that frequent Puget Sound, regarded as a family member in tribal cultures. Washington tribes on Friday rebuked the recommendation to move forward with the project. Southern resident killer whales face a sevenfold expansion in oil-tanker traffic if the project is built. The pipeline could potentially harm the whales in many ways, from hurting the chinook salmon on which the whales depend, to deaths by ship strike, the board found. The “entire ecological context” of the southern residents is potentially significantly affected because of the project, the board found. Vessel noise is one of the main threats to the southern residents because it masks the sounds they need to hear to effectively hunt for salmon. The southern residents’ critical habitat lies entirely within the waters transected by oil tankers servicing the pipeline. Canadian conservation groups also warned the project can’t be mitigated because even existing noise and disturbance to the southern residents is too much, let alone more.